Here's a fun photo that was completely planned a few weeks before the wedding, based on a concept of the bride and groom's to involve the younger members of their wedding party in a fun, unique way. 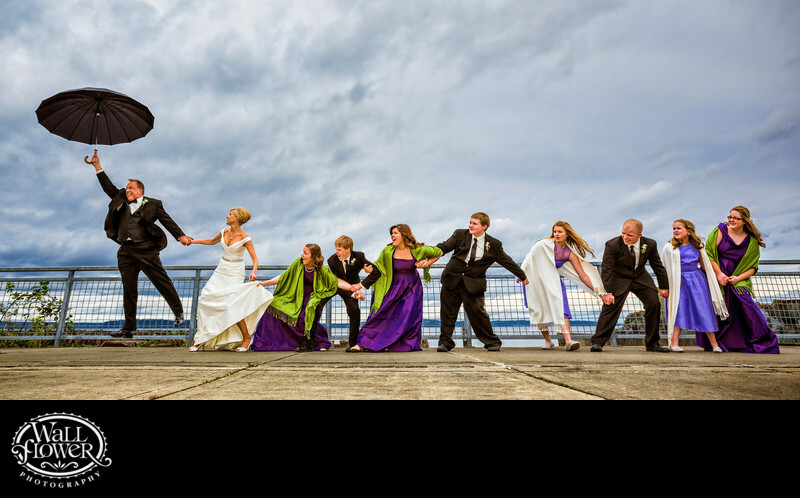 A chain of junior bridesmaids and groomsmen led by the bride is holding the groom, who in turn is holding a large black umbrella, to prevent him from blowing away in a sudden gust of wind. The photo was shot along the Ruston Way waterfront in Tacoma, Washington, with some of my own lighting to supplement the soft, even natural light cast by those cloudy skies. We took three takes, and this photo is the third one, although several of the participants were brought over from the second take. The ground was cleaned up in Photoshop, and the detail has been enhanced throughout the photo and particularly in the clouds. This photo won an award in the International Print Competition (IPC) of the Professional Photographers of America (PPA) and was accepted into the General Collection.